Puebla _ We drove through the mountains of the spirits last night on the heels of tractor-trailers in their nightly journey through the dark winding roads that start outside Cordoba, Mexico. We were the only small car drifting among these giants of the midnight hour carrying double loads slowly in and out the mountain through the autopista to Puebla and Mexico City where we were pushing to arrive, exhausted, delirious and full of adrenaline. Unlike our first trip where we had our CB radio working (our magnetic antennae got stolen the first month in Guatemala) we were not tuned into their frequency, their casual banter, cursing and fireside story exchange. But I felt it and it was comforting to feel that collectivity in the effort. “Remind me again why we’re driving at midnight to get to Mexico City,” I asked Brad during a particularly thick stretch of fog. I knew he wanted to make up lost time for the biggest detour we’d both ever had to do. We were pushing our 15th hour of driving. The floods and derrumbes from the various tropical storms during the season had made climate change a thing of the present in Mexico where one of the most used autopistas from Coatzacolacos and La Tinaja and Veracruz was closed completely. That’s 271 kilometers of road that is the portal from Southern to Central Mexico is entirely closed. (1) From the autopista from Tuxtla Guiterrez go until the city of Chapo, 16 KM before Coatzacolacos, Veracruz on the Gulf Coast. (2) Go West taking the Libre or Public Road towards Minatitlan and Cosoleaoleacaque and eventually Acayucan. Part of the autopista is open here, but they will re-direct you towards the public road, so just save the toll money and get on the public road that has signs for “Acayucan”. It’s slow and congested because of all the redirected traffic, but enjoy the local scenes out your window. (3) When you get to Acayucan to south towards Suyula and Palomares. You will be heading south at this point and crossing into the state of Oaxaca and taking that 80 KM detour. Be prepared mentally for the worst road you’ll probably ever had journeyed in your life (well, unless you’ve lived in Guatemala and travelled to Lancetillo, Zona Reyna). Buy yourself water, food and have a full tank of gas (most definitely a spare time) because I didn’t see a single gas station along the way. Now, what makes it so bad? It has potholes big enough to swallow up your car and the whole concept of continuous asphalt for more than one minutes is something you soon abandon. After getting off this road for a few hours later I had visions of potholes wherever there was a dark spot on any roads any major road. The road alternates between graded road, no road, broken asphalt and for most of the way looks like a moth-eaten blanket. But you pass through some incredibly beautiful scenery and small towns with very good tacos. (4) Once you’ve completed your 80 km of purgatory, you can turn right at Palomares and head northwest towards Tuxtepec which was the road people used before the autopista. You will be covering the same distance as the autopista, but since the road isn’t as bad as the road to Suyula, it’s still incredibly narrow, pot-holed and just not a place you want to drive a night or if it’s been raining. One pothole taken at a wrong angle and you got a blowout or worse if you’re trying to go fast. Good luck with that and all the stalls along the way. We got out just as dusk set in, but it took us six hours to travel 250 Km or 156 miles. (5) Once you enter Tuxtepec you’re in the biggest town since Acayucan, but it doesn’t mean the roads are without potholes. In fact, we almost lost tires to these massive potholes at the entrance to the city. From Tuxtepec you have to keep heading northwest to Tierra Blanca. Go straight straight, do not veer off anywhere until you get to the puente headed towards Cosamalopan that is really backed-up from all the re-routed traffic. Make sure to ask all along the way, roll down your window, holler at the cab drive next to you or any decent looking local how to get to Tierra Nueva and follow the long line of tractor trailers. You will have to pay a cuota to get on the bridge and the road that you will eventually be redirected to in order to get to Tierra Blanca. When you finally wind around after the bridge and onto the road to Tierra Blanca the road is awesome, long continuous stretches of asphalt, but be VERY VERY careful of the topes that punctuate all the small downs. There are usually two at the entrance and two before exiting and 80% unmarked by paint or signage. Again, not a road I recommend driving at night, but if you have to as we did, then it’s a relief to be able to count on the ground underneath you. 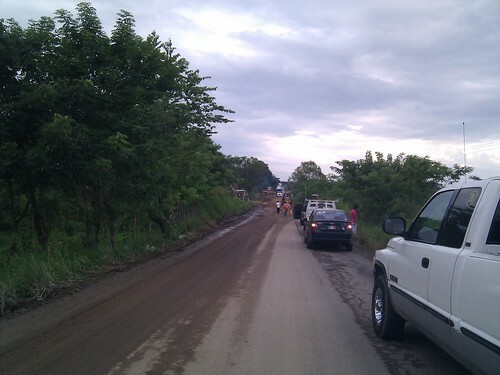 (6) From Tierra Blanca to Tinaja is 36 KM of pure anticipation for the autopista. When you get to Tierra Blanca veer right where the road forks and get on the Cuota road to Oaxaca, it’ll also be on your right. From there you will follow signs to Cordoba/Oaxaca and eventually just to Cordoba and Puebla. Eventually you will pay your toll money and right after the roll booth is a much needed espresso pit stop at the Italian Coffee Company store right next to the Pemex. If you’re driving at 10 PM towards Puebla after a 12-hour downward journey to meet with Orpheus, I recommend this pit stop. If the espresso is not what you’re looking for, they also have pretty awesome carrot cake, sandwiches wifi and a children’s playground. Posted on Tuesday, October 5th, 2010 at 11:59 pm. Filed under: Blog, Team Guate	RSS 2.0 feed.